Satterwhite logs are cut from dead standing Engelmann Spruce found high in the Rocky Mountains (usually Colorado & Utah). 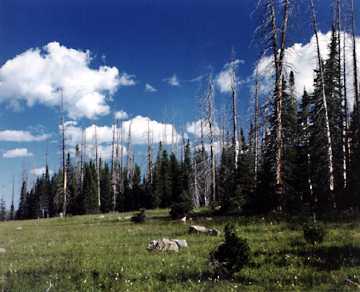 The trees at the edge of this alpine meadow are at 10,000 ft., and have been dead for over 40 years. High in the Rocky Mountains, vast tracts of timber have been killed by periodic beetle epidemics. The beetles kill green trees, but do not harm the wood, leaving a tree dead but still standing and sound. There, at high altitudes, where the humidity is low and the precipitation is mostly snow, trees stand for years, sometimes decades. Over time, this dry climate and natural curing process thoroughly dries dead-standing trees. Dry wood is necessary for dimensionally stable lumber and house logs. Wood used in conventional home construction is dried, usually by kiln or air drying. This process works fine for lumber and boards, but with sizable pieces of wood, such as house logs, the results are far from satisfactory. While kiln or air drying logs yields a certain degree of dryness, it's difficult to dry large house logs all the way to the center by duplicating the natural aging process. All logs shrink, warp, and crack to some extent during the drying and aging process. With Satterwhite Logs, the shrinkage and warpage have already occurred before the logs are used in your house. Our house logs, made from dead-standing timber, are stable. By building with Satterwhite Logs, you get benefits in both in the long run  with the stability of your home, and in the short run  with labor and freight savings due to lighter weight. House logs from dead-standing timber greatly simplify every phase of construction. Builders using green logs must take extraordinary precautions to allow for settling and shrinking. Openings for doors and windows are built oversized and with special designs so that over the years the settling logs do not press down on windows and doors. Hundreds of joints have to be routed and splined to prevent gaps as the house ages and to keep logs from splitting. Corner systems have to be engineered to keep corners from separating. With Satterwhite Logs made from dead-standing timber, we don't have to make these allowances for drying and aging wood because our logs have been thoroughly cured before they are ever used in a house. Satterwhite Log Home construction is simple and straightforward, practical for do-it-yourself builders or professionals, and much less labor-intensive than green construction. We are one of the few log manufacturers who qualify to use the word "dry" on our gradestamp, indicating moisture content of less than 19%. Fact is, most of the house logs we mill are less than 14% moisture content. Nature provides us with an excellent source of house logs in high altitude spruce and lodgepole pine that are killed by beetle epidemics and, occasionally, forest fires. Dead timber is great for house logs but is almost useless for most other purposes. It's nice to think of building houses without killing green trees. Throughout the Rockies, vast tracts of timber have been standing dead for decades. Among the dead timber, there is a young green forest growing up underneath. When Satterwhite logs dead standing timber, we remove a big source of fuel and lessen the danger and severity of forest fires. Environmental impact assessments are made in all logging areas and great lengths are taken to protect the young green forest for future generations. Satterwhite never practices clear-cut logging. Our lumberjacks work only on trees specifically designated, and take maximum care not to injure green living trees when felling the dead. When we do inadvertently damage green trees, we make restitution by planting new seedlings. Logging is a big job and requires heavy equipment such as bulldozers, skidders, loaders, and large trucks. In all cases, Satterwhite locates roads and skidder paths in ways to minimize negative effects such as erosion and soil compaction. When we are finished in an area, we plow and aerate the soils affected by our machinery, replace trees as necessary, and restore ground cover, leaving little evidence of our logging activity. Only vital green trees where once stood a forest of dead wood. In cases where directed by the forest service, Satterwhite clears permanent roads which open public lands for recreational use by vacationers and campers. Nature didn't put the best house logs in an easy to get to spot. Frequently, logging operations are 2-3 hours and 50-60 miles from the nearest paved roads. Trucks have to be loaded and unloaded with the speed and precision of an Indianapolis pit crew just to make two runs a day. When you consider that Satterwhite can only log about 90 days a year, between mid July and mid October, depending on snow, you can see why our crews have to work so hard to get out a year's supply of material. In a typical season, we carefully remove 20-30 million pounds of dead trees. To see Satterwhite logging operations first hand, order a copy of our video in the Special Offer section of this web site. You are also welcome to visit one of our logging operations offices. Popularity of log homes from dead dry timber has increased dramatically as consumers have realized the value of using dry wood to build their houses. Logging costs are understandably high and getting higher when you know how remote and inaccessible this timber is. The point is that we believe very strongly in using dry, stable house logs, or we'd be logging in our backyard in Texas. Even though we go to more trouble and expense than other manufacturers, you'll see that our prices are extremely competitive. Satterwhite Logs are manufactured from Engelmann Spruce trees found high in the Rocky Mountains of the American West, principally Colorado and Utah. Most Satterwhite homes use Western Red Cedar, conventionally cut and dried, for exterior trim, gable ends, and porches. Satterwhite Logs come in a variety of shapes and sizes. Most people choose our popular D-shaped logs because they allow a traditional log appearance on the outside while yielding a flat interior wall. Flat interior wall surfaces preserve the rich look of real wood and make installation of electrical switches and outlets uncomplicated, while eliminating "dust catchers." Of course, Satterwhite offers a variety of other log designs which allow a wide range of customization. Some people prefer the rustic log look on interior as well as exterior walls, so Satterwhite offers a full round log with curved surfaces on both interior and exterior walls. Other materials include thinner logs designed for interior partition walls. These partition logs match the inside look of D-shaped house logs, but are flat on both sides for exposure to both rooms on either side of the wall. One of our newer log styles is a square rough-cut log designed to accept chinking and yielding a hand-hewn log home appearance. For ultimate flexibility, Satterwhite can custom mill logs to your specifications. Beveled exteriors, single tongue-and-grooves, triple tongue-and-grooves, rustic unmilled exteriors, and many other options are available. We even offer saddle-notched full round logs with coped bottoms.